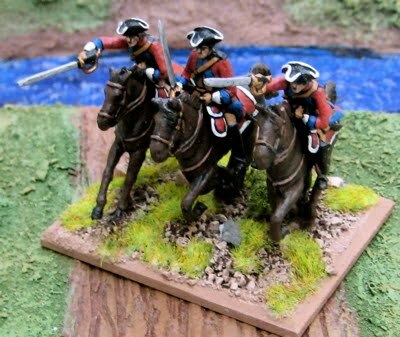 Most of my Seven Years War figures are British and French and really meant for battles in North America. Like many of my collections I have figures based on multi-figure bases for larger scale battles and individually based figures for skirmish games. The multi-figure bases for Big Battle games were organized along the lines of three (and later four... sort of... that's still up for debate...) stands per battalion-sized unit. Batteries of guns were represented by single elements. I've used these with a DBA variant and Black Powder. I think I like the simplicity of the DBA-based game better... probably stick with that when I ever get back to gaming with them. The individually based figures were initially used with Savage Worlds, but I am keen to try out Song of Drums and Tomahawks or Flashing Steel. British Highlanders - from Rafm - this is a 32 figure/four element regiment. I did one of the elements as two half elements so the command element could remain front and center when in line... I may abandon this organization and go back to the three element regiments. British casualties from Wargames Foundry...? 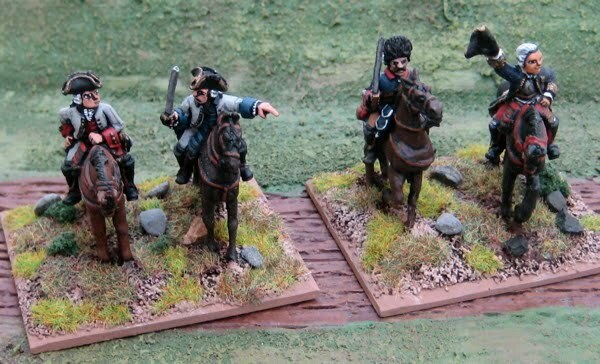 Two Command Elements - I believe they are all from Old Glory Miniatures. The fellow waving his hat over on the right is supposed to be the Marquis de Montcalm. French Infantry go here... at some point..
A few elements of generic North American Natives - the figures from Old Glory Miniatures. More of the same individually based for skirmish gaming. 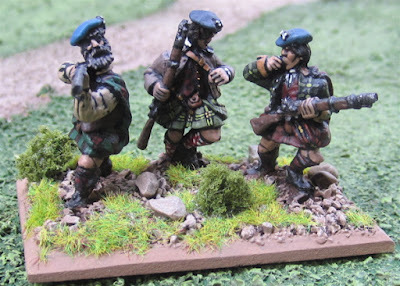 A single element of skirmishing Jacobites - the figures from Old Glory Miniatures. I did these just to try them out. The "regulars" will be organized in regiments of three elements with six figures per element/base. I have enough of these figures squirrelled away for 3-4 such regiments. Dead and dying Jaocobites. Figures from Dixon Miniatures and Front Rank Figures. 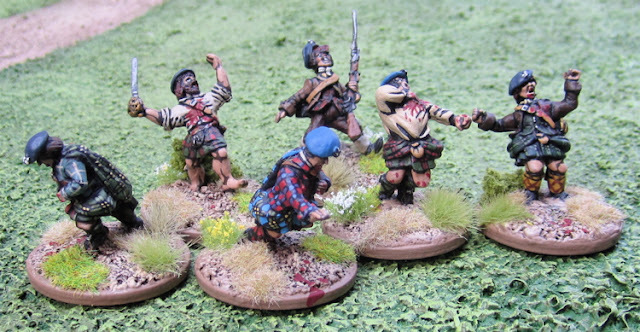 A few Jacobites individually based for skirmish gaming. YAAAARRRRR!! Shiver me timbers and all that... Pirates! Assorted figures - the peg-leg on the left is from Rafm. The fancy fellow in the center and the skeleton are from Reaper Miniatures. The other two in the back... I'm not sure about... so that's why they ended up in this picture. 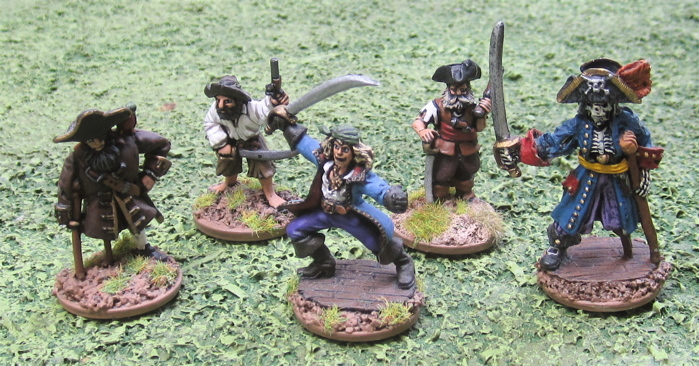 Technically also pirates - this is a crew I put together of all female pirates. They were first used as a warband in Mordheim, then later saw action with Savage Worlds: Pirates of the Spanish Main... perhaps they'll see action again with Flashing Steel. 18th century women-folk. The woman front and centre with the voluminous white dress and the two in the back corners (blue dress, loading musket, green dress advancing with musket) are all from Old Glory Miniatures. The figure in the center back (blue dress, firing musket) is from Rafm. The rest are from West Wind Productions. Fancy Gentlemen. The figure front and center - brandishing a sword - is from West Wind Productions. 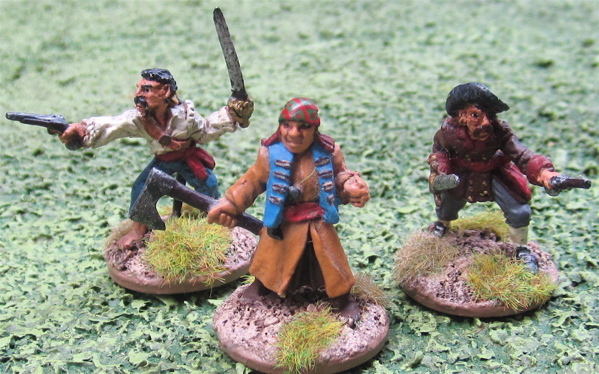 The rest are from Old Glory Miniatures. 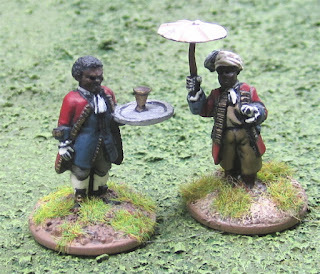 Servant slaves from Old Glory Miniatures. 18th century men-folk. Teh fellow on the right (with the green vest and hands behind his back) I think might be from Wargames Foundry - the rest are from West Wind Productions. Thank you, Paul! 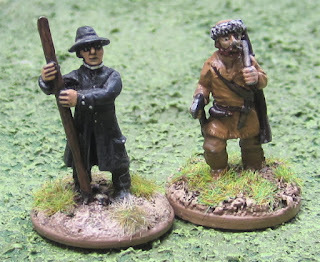 I have piles and piles of more Jacobites to paint - along with loads of clansmen for the English Civil War. I do like how they turn out, but they are rather time consuming! !